In the unseasonably warm weather of March 2012, one of the Darwin Correspondence Project editors noticed a rather unusual and attractive bee in the currant bush outside her kitchen window in Cambridge. With the help of the Natural History Museum’s excellent bumblebee identification guide, she discovered that the bee was Bombus hypnorum, the tree bee. The tree bee was first reported in the UK in 2001 in Wiltshire and has made steady progress since then extending its range up to Northumberland in the north, and west to south Wales (see ‘Bombus hypnorum (Hymenoptera: Apidae), a new British bumblebee?’ British Journal of Entomology and Natural History 2001). It is very widespread throughout Europe, and ranges as far north as the Kola peninsula in Russia. According to the Bees Wasps & Ants Recording Society (BWARS), it has the potential to colonise all of Great Britain and is unlikely to have any negative impact on other species. It appears not to have been introduced to the UK by any conscious human intervention, and in contrast to the case of African killer bees accidentally released in Brazil in the late 1950s and now present in some parts of the United States, no dire environmental consequences are likely to ensue. It is perhaps a sign of the times that the pleasure experienced in observing any new species in unfamiliar surroundings is tempered by worry about its environmental impact. How different our attitude is from that of most Victorians, for whom the large-scale introduction of any animal or plant deemed to be economically useful or even just decorative was generally viewed as positive or at least unproblematic. John Lubbock seems very much ahead of his time when, in a letter to Darwin in 1867, he commented on Edward Wilson’s plan to introduce humble-bees (as bumblebees were then more commonly known) to Australia, ‘As to the Humble Bees they would if once landed in Australia probably destroy some native insect & I wish Mr. Wilson would leave the Australian fauna alone.’ No doubt many Australians today would second Lubbock’s sentiment. It is interesting to contemplate an entangled bank, clothed with many plants of many kinds, with birds singing on the bushes, with various insects flitting about, and with worms crawling through the damp earth, and to reflect that these elaborately constructed forms, so different from each other, and dependent on each other in so complex a manner, have all been produced by laws acting around us. These laws, taken in the largest sense, being Growth with Reproduction; Inheritance which is almost implied by reproduction; Variability from the indirect and direct action of the external conditions of life, and from use and disuse; a Ratio of Increase so high as to lead to a Struggle for Life, and as a consequence to Natural Selection, entailing Divergence of Character and the Extinction of less-improved forms. . . But why was Lubbock so much more sensitive than many of his contemporaries to the downside of environmental tinkering? Darwinian evolution theory fundamentally changed the way we understand the environment and even led to the coining of the word ‘ecology’. Lubbock was sixteen when the Darwins became neighbours of his at Down, and Darwin encouraged Lubbock’s interest in natural history from the start. Lubbock would have learned about Darwin’s ‘entangled bank’ understanding of nature at first-hand, and among the foremost lessons was the view of an ever-changing, dynamic nature in which species were ephemeral and habitats, once destroyed, could not easily be recreated. Instead of the comforting representation of a cyclical recurrence of familiar animals and plants as season followed season, Darwin offered a more unsettling picture of constant and irrevocable change, and much of his own research focused on the adaptive ability of plants and animals. The routes remain the same for a considerable time and the buzzing places are exactly the same to within an inch. In order to test this, I should mention, that I repeatedly stationed five or six of my children, each close to a buzzing place, and told the one farthest away to shout as soon a bee buzzed there: “here is a bee”, and so on with the other children one after another, the words “here is a bee” were passed on from child to child without interruption, until the bees reached the buzzing place where I myself was standing. In an 1841 letter to Gardeners’ Chronicle Darwin wrote about ‘the humble-bees which bore holes in flowers, and thus extract the nectar’ and speculated about this behaviour as an example of acquired knowledge in insects. The letter was in response to one from a disgruntled gardener advocating the destruction of bees, but Darwin pleaded against this: ‘one would lament to see these industrious, happy-looking creatures punished with the severity proposed by your correspondent’. Over thirty years later, when researching the aspects of floral morphology that encouraged cross fertilisation for his botanical book Cross and self fertilisation, he renewed these observations – in one experiment comparing the strategy of bees visiting native and introduced species of peas of the genus Lathyrus. He had determined that in England varieties of sweet pea could be planted side by side but never seemed to cross. Bees were visiting the flowers but not effecting cross fertilisation. Darwin wrote to the Italian botanist Federico Delpino to ask if varieties crossed there. Delpino replied that in Italy by contrast, in order to preserve varieties, gardeners had to plant them separately (the full texts of the letters exchanged with Delpino are published in volume 21 of The Correspondence of Charles Darwin). Darwin came close to the answer when he noticed a leafcutter bee, Megachile willughbiella entering the flower the ‘right’ way; that is, depressing the keel so that the mechanism which caused pollen to be deposited on the bee would be engaged. The problem for sweet peas was that their natural pollinators (Megachile ericetorum) didn’t live in Great Britain. 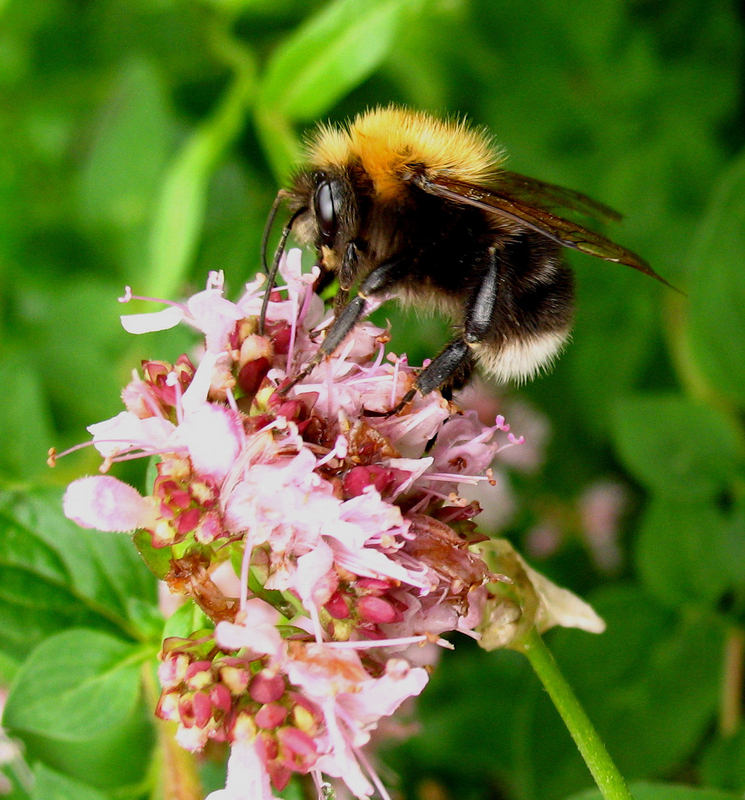 In May 2012 a second attempt was made at reintroducing the short-haired bumblebee (Bombus subterraneus) to England from Sweden. The loss of its native meadow habitat had led to its decline and it was declared extinct in the UK in 2000. Originally, the plan was to reintroduce the bees from New Zealand using descendants of bees taken there from England in the Victorian period. It isn’t so easy to turn back the clock in the natural world, however: the bees did not survive hibernation during the journey, and it has also been discovered that the New Zealand population suffers from significant inbreeding. Reports detailed observations on humble-bees boring holes in flowers to extract nectar instead of brushing over the stamens and pistils. Some hive-bees seem to use the holes made by the humble-bees; speculates that this would be a case of acquired knowledge in insects. Introduction of humble-bees into Australia. Encloses account on habits ofBombus.